Tour America's oldest seaport aboard M/V Lady Jillian. Enjoy area attractions of the inner harbor at your own pace. 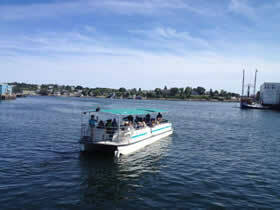 The Water Shuttle connects Gloucester's two Cultural Districts, Harbortown, and Rocky Neck. 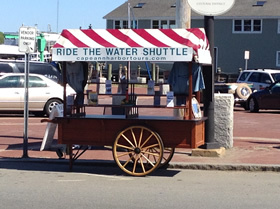 Ride the Water Shuttle, it's the best deal in town! 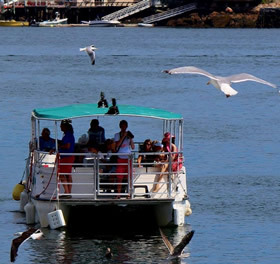 (On The Hour) Harbor Loop/Jacobs Landing: Solomon Jacobs Park, Gloucester Maritime Heritage Center, Schooner Adventure, Fitz Henry Lane Park, Downtown shopping and restaurants. 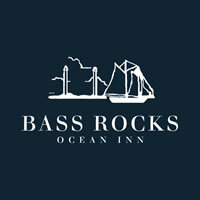 (15 min after the hour) Saint Peter’s Town Landing: The Beauport Hotel, Gloucester’s West End, Latitude 43, Cape Ann Brewery, Cape Pond Ice, Downtown shopping and restaurants. (35 min after the hour) Rocky Neck: The Studio Restaurant, Rocky Neck Art Colony, Gloucester Marine Railways, shops and restaurants. ***Upon Request*** (45 min after the hour) Cripple Cove Landing: Benjamin Smith playground. Last Departure - 5:00 p.m. Weekends 12:00 p.m. - 4:00 p.m.
Last Departure - 3:00 p.m.